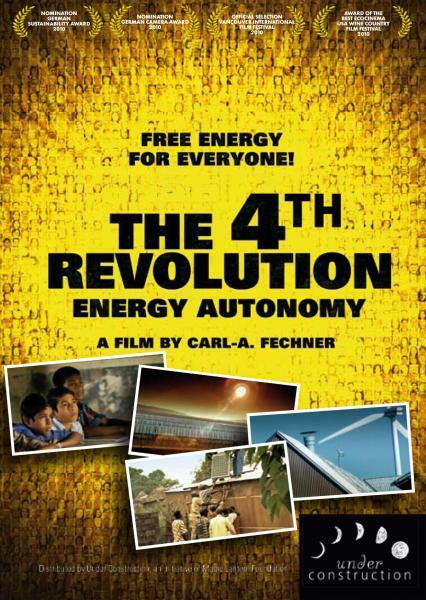 The 4th Revolution – Energy Autonomy: The international DVD is available with following subtitles: German, English, French, Polish, Romanian, Spanish, Japanese, Portuguese and Dutch. This painstakingly produced documentary film calls for an energy shift away from fossil and nuclear fuels to renewables. The captivating vision is for a global community whose energy supply is 100 percent provided by renewable sources – available for everyone, affordable and clean. A global restructuring can begin, resetting the balance of power and more fairly distributing capital. As it journeys around the world, the film observes the life and work of ten individuals who are united by one goal: Energy Autonomy. Director Carl-A. Fechner and his team travel with prominent individuals and speak with leading managers, mothers in Africa, bankers and ambitious activists around the globe. Solutions emerge as the film unveils impressive photos and clear statements; it causes the viewer to think further and act and has already become more than just a film. It’s a movement. Germany’s most successful cinema documentary of the year 2010! Do your part to spread the message! Make energy transition happen!